I once traveled with him to a Navajo reservation and watched in the dim light of a rundown adobe dwelling as he leaned over to hear an old man talk about the struggles of his people. I heard Native Americans share their pain as if they somehow knew, because of a certain sorrow in his heart coupled with an active and tough mind, that my father would do everything to help. So it happened wherever he went – on the streets of the Bedford-Stuyvesant neighborhood in Brooklyn, in a square in Warsaw or in the well of the Senate. And wherever he could, he acted. After visiting Bed-Stuy, he pressed his campaign donors to direct investments into one of New York City’s poorest and most neglected neighborhoods. After my grandfather had a stroke, he was paralyzed on his right side and could say just one word, “no,” which he repeated over and over. For nine years, this larger-than-life figure, this once strong, powerful man, could say nothing more. But his son would have long political discussions with him. They talked about running for president – the mood of the electorate, the dynamics of the various states. All you could hear from my grandfather was “no,” but repeated with a nuance that allowed my father to discern his still sharp political assessments. 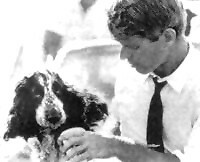 That same quality made each of his children feel deeply loved and made all nine of our dogs worship him, especially Freckles, who followed him on the campaign trail. Robert Kennedy had a wonderful way of allowing others to tell him how the world looked through their eyes. Indeed, so many people across this nation were grateful for his belief in their worth – they knew his faith in the humanity of his fellow Americans. Joseph P. Kennedy II, remembers his father Robert F. Kennedy, in The New York Times. 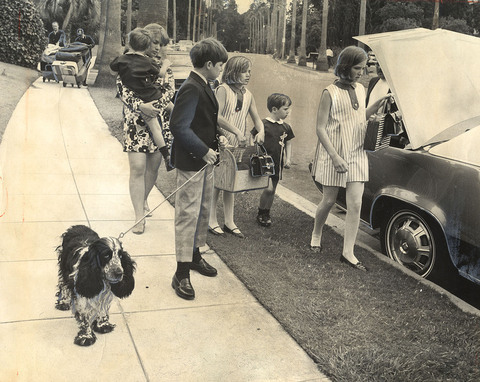 Kennedy’s children, Kathleen, Matthew, Michael, Mary Kerry, Christopher and Mary Courtney and the family dog Freckles leave the Beverly Hills Hotel to return to Virginia after Vice President Hubert Humphrey sent a plane to get them.